Experience a sudden appreciation for something that you thought you didn't like? 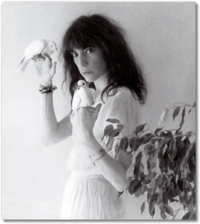 This has happened to me recently with Patti Smith. I never "got" her in the past. She was someone that I always "respected" in the sense that I respect that many people with good taste thought she was a fantastic musician. But only recently did I feel blown away by listening to her. I wonder what accounts for my sudden shift? Maybe my tastes have matured over time? I don't know the answer, but I can tell you, if you've never listened to Horses, or if, like me, you didn't get it the first few go arounds, give it another try. She is amazing...and the album captures what I imagine it must have been like to be part of the art/punk/literary scene of NYC in the 1970s. An incredible imaginary time capsule. Maybe some day I'll experience a similar sudden appreciation for other critically acclaimed people/things including: Bob Dylan, Bruce Springsteen, caviar, and foie gras. *"I'm so hot! My eyes are sweating!" *"Happy Face. Happy Face. Go away your tears. Happy Face. Happy Face. Go away your tears." "Belle and the Beauty Beast"
"Which tooth is my sweet tooth?" I absolutely love her 4.5 year old mind. She cracks me up!